It’s no secret that in these tough economic times (using this bit for four years now, wow) people will do just about anything to make a few bucks. One of the most popular ways is by recycling. And one of the most popular ways of recycling is by recycling copper. And one of the most popular ways of obtaining copper is by stealing it. Finding places to steal this precious element is where people become especially crafty. I found this notice on the men’s bathroom door at Valley Oak Park the other day. There was one on the women’s bathroom, I think, but it was ripped off. It must be hard to recycle this sort of thing as it would be a bit obvious when you turn up at your local recycling station. Ah, that’s right, people strike again. J.A. Recycling did not follow any of the rules, giving us cash for the copper on the spot. When we returned to ask why, workers started leaving…The same scenario played out at Highlands Recycling off Elkhorn Boulevard…Next door at A-1 Recycling, they did take our team memberâ€™s driverâ€™s license and thumb print, but there’s no evidence photos were taken of him or the material, and he was given cash instantly. The state legislature passed AB 844 in 2008, requiring all recycling centers that buy copper to check the seller’s photo ID, take video or a photo of the seller and the material being sold, and also collect their thumb print. People, once again, are awesome. We have already hit peak copper, so by the time guys like us dive all the good copper will already be gone. Like the sap who showed up for the California gold rush in 1851.
cogmeyer, actually more gold was taken out of the ground in 1851 than in all previous years combined. For example, the Yreka find in 1851 was the biggest nugget find of the entire gold rush. Okay, Buzz Killington, you got me. But maybe while you were focusing on the glittery numerator (qty of gold extracted) you completely ignored the denominator (how many Californians were splitting that gold). The non-native population of California went from thousands in ’48 to several hundred thousand by 1853. I think there is still a good argument that the 1851 and 1853 arrivals were tardy and subsequently gold-less saps. Mr. Topofit’s point should not be lost. I work for another park district and we’ve been badly hit by similar vandalism/thievery. In one location, twice the thieves have taken a small amount of copper (like 50′ of 14 gauge) that probably doesn’t make a pound but costs us (ultimately, taxpayers) $2,000 electrician’s+our staff time to have reinstalled each time. I very much blame the recycler’s who wink at these characters bringing in obviously stolen property. Don’t they call that, “Receiving Stolen Property”? 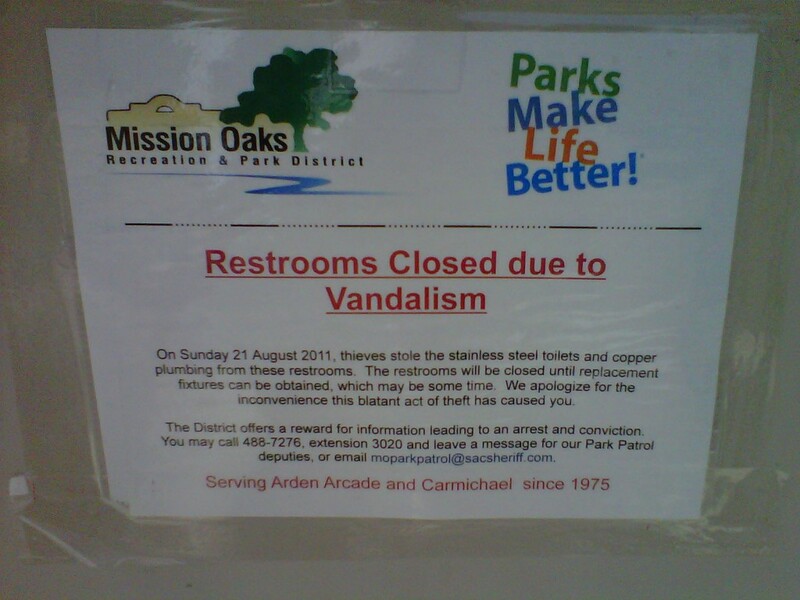 Some of our facilities will soon be sporting signs modeled after Mission Oaks’, but phrased slightly stronger. It’s a widespread problem. I thank Mr. Topofit for bringing it up. A few years ago, my work for another government agency took me to a property where several oddly behaved fellows were engaged in stripping large spools of phone wire. Ever the innocent, I had no idea what I was watching then. Now I do. Once or twice a year I will participate in river cleanup in the Northgate/160 exit area. It is common to see circular fire rings where our local urban campers, apparently not having enough spare time to manually strip the wire, instead burn the insulation off of big rolls of Romex. What will those lovable lugs think of next?